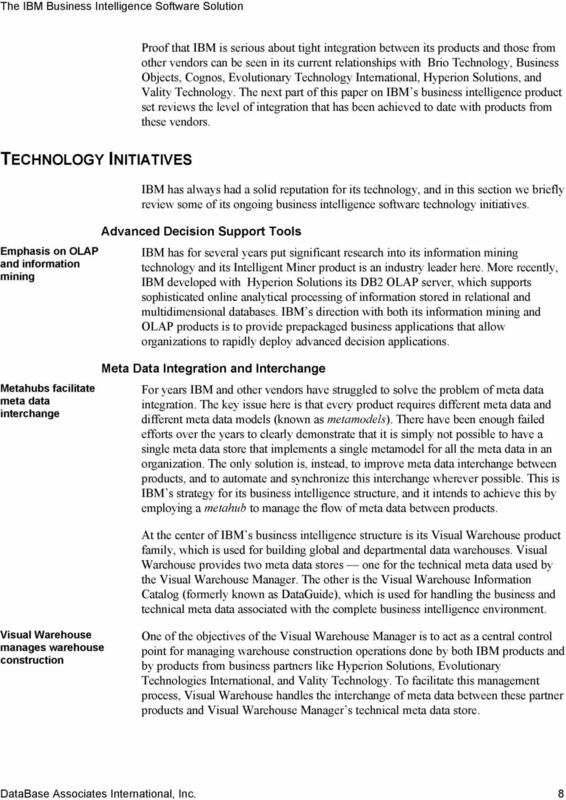 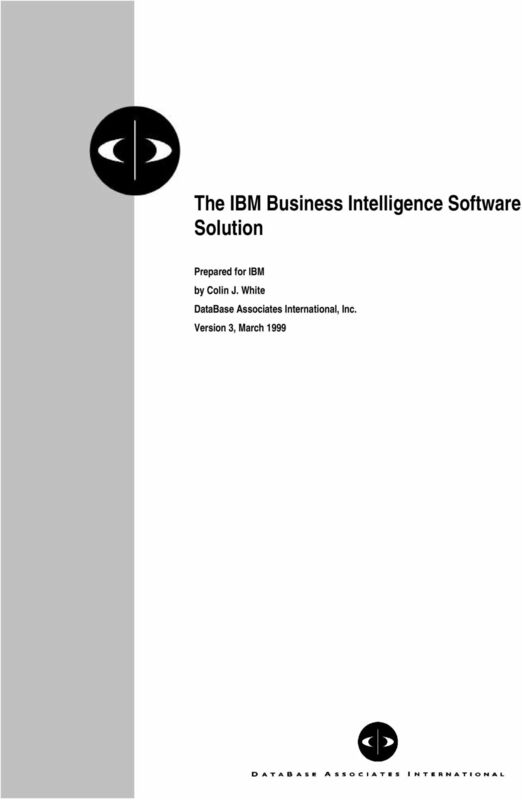 Download "The IBM Business Intelligence Software Solution. 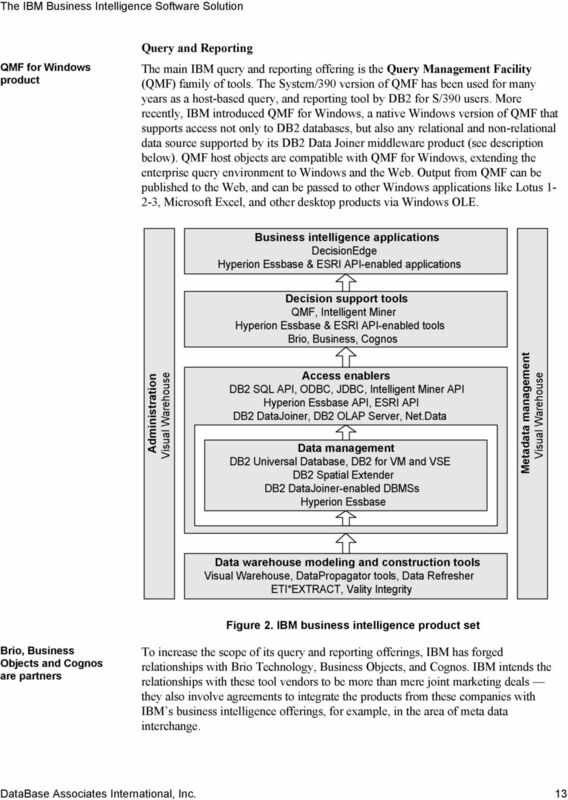 Prepared for IBM by Colin J. 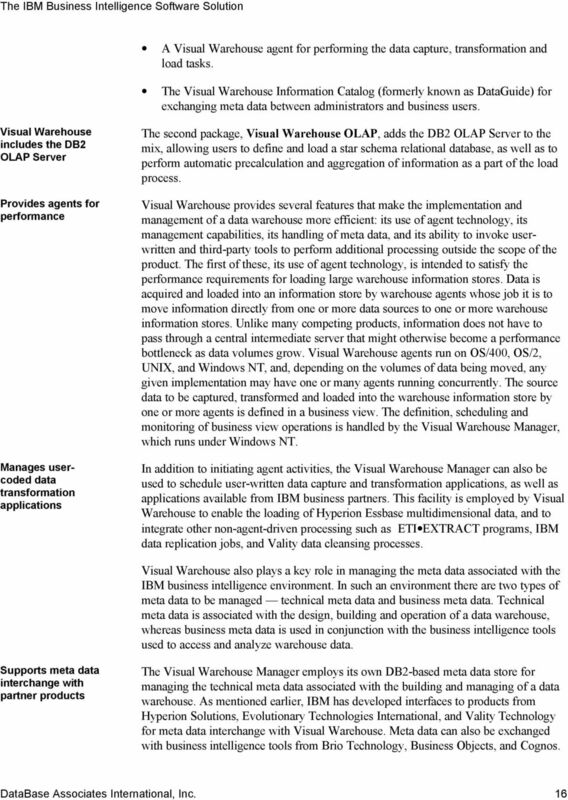 White DataBase Associates International, Inc. 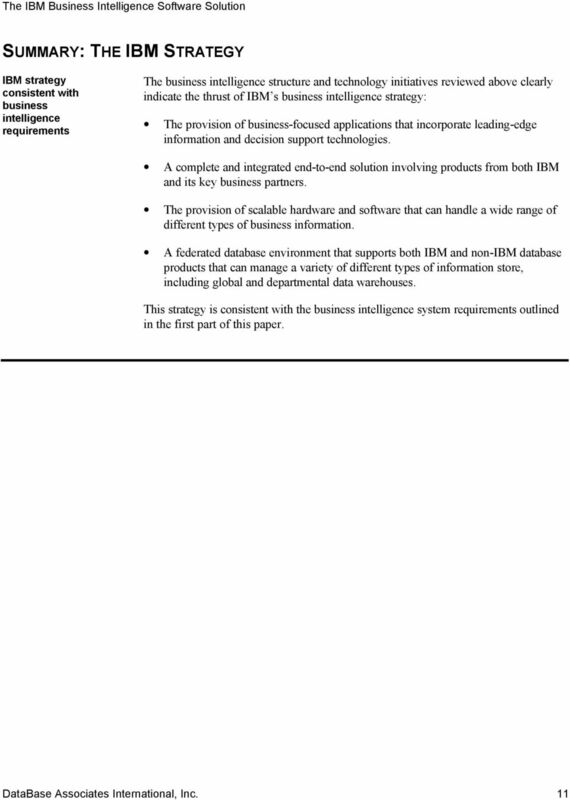 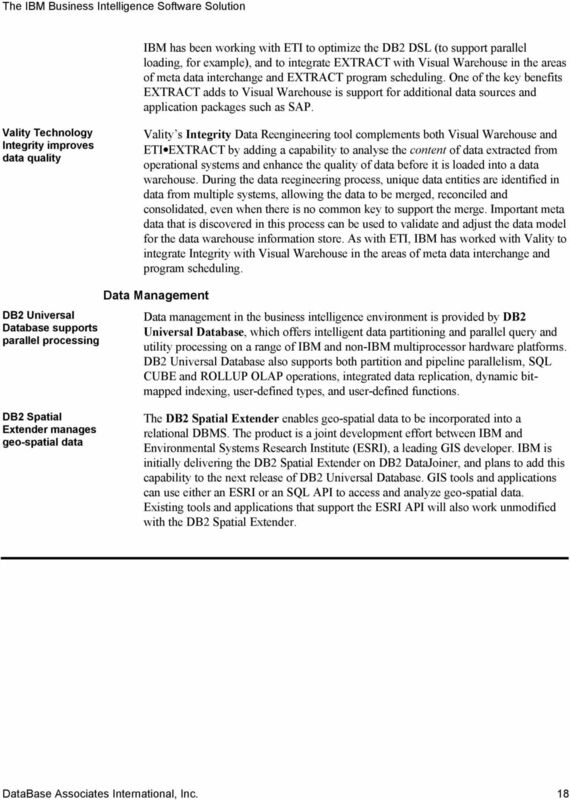 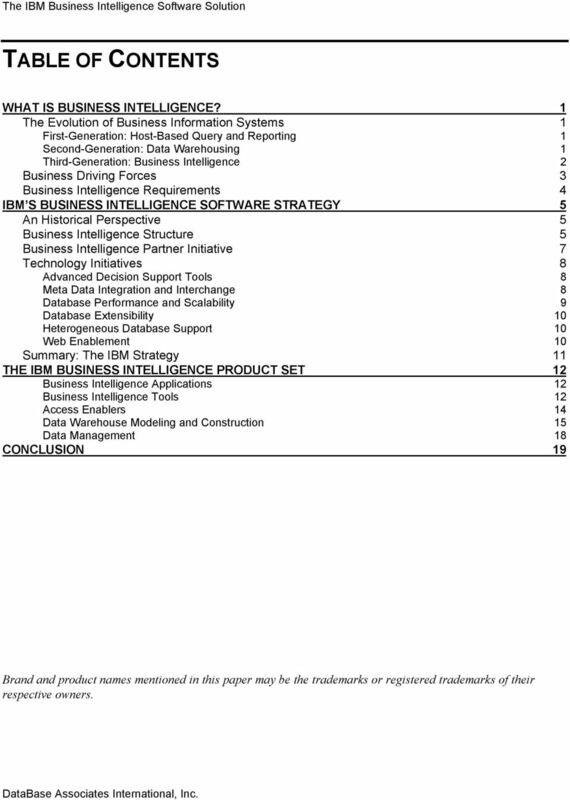 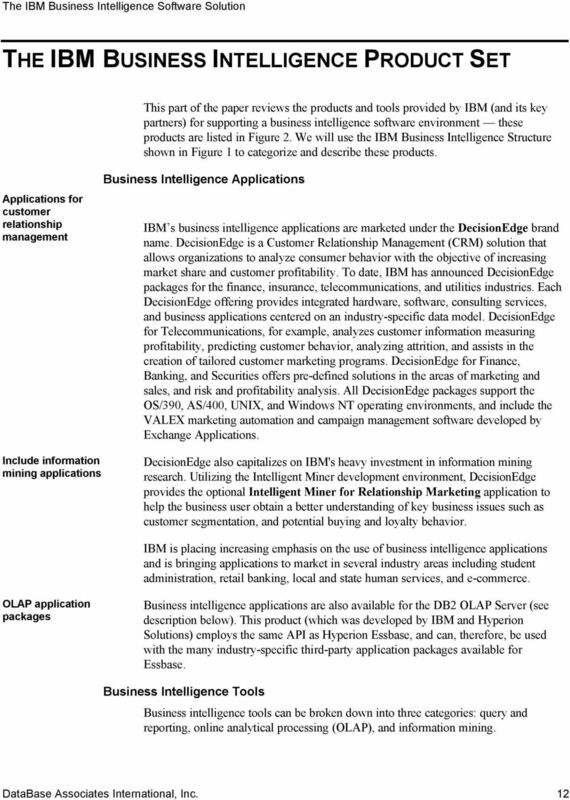 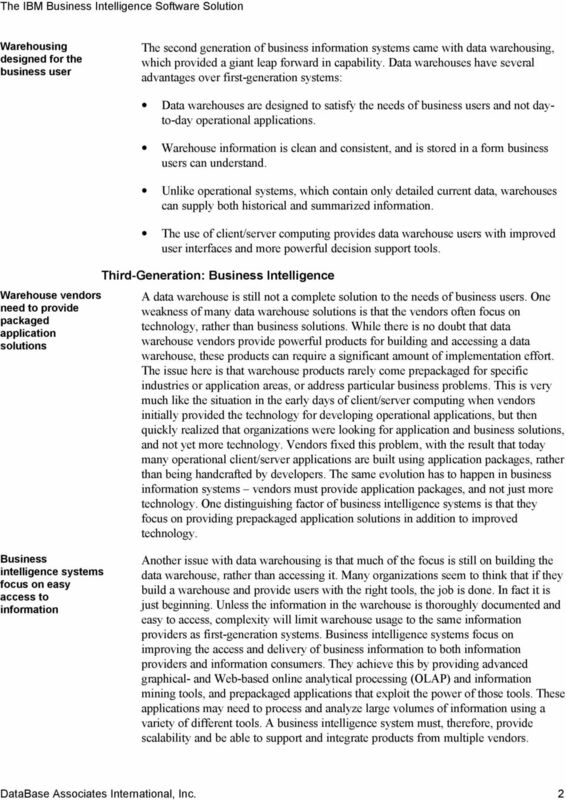 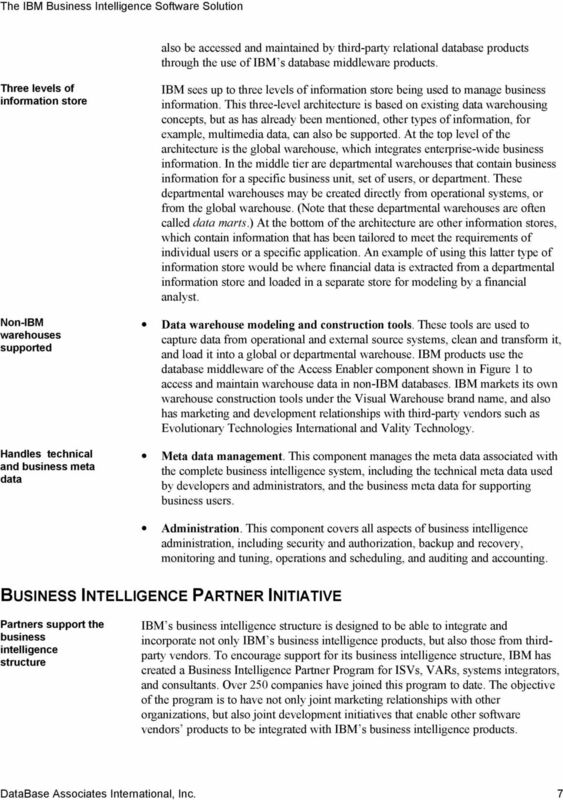 Version 3, March 1999"
2 TABLE OF CONTENTS WHAT IS BUSINESS INTELLIGENCE? 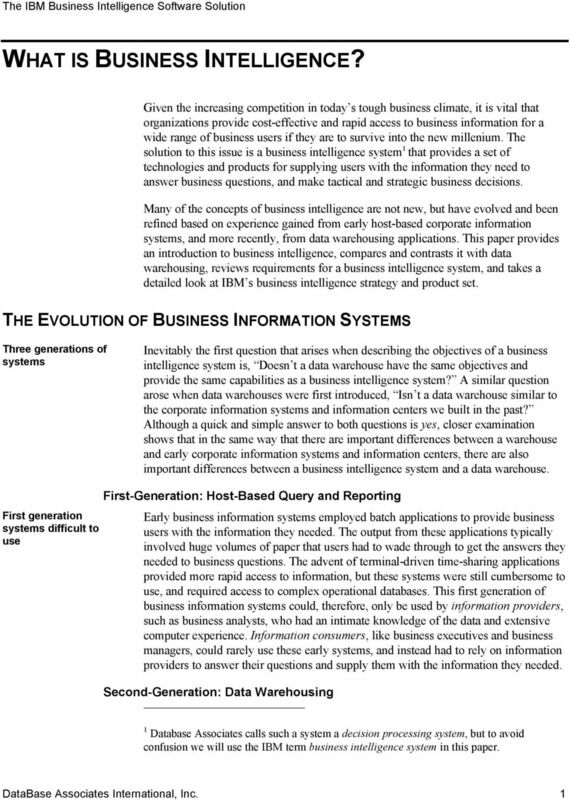 1 The Evolution of Business Information Systems 1 First-Generation: Host-Based Query and Reporting 1 Second-Generation: Data Warehousing 1 Third-Generation: Business Intelligence 2 Business Driving Forces 3 Business Intelligence Requirements 4 IBM S BUSINESS INTELLIGENCE SOFTWARE STRATEGY 5 An Historical Perspective 5 Business Intelligence Structure 5 Business Intelligence Partner Initiative 7 Technology Initiatives 8 Advanced Decision Support Tools 8 Meta Data Integration and Interchange 8 Database Performance and Scalability 9 Database Extensibility 10 Heterogeneous Database Support 10 Web Enablement 10 Summary: The IBM Strategy 11 THE IBM BUSINESS INTELLIGENCE PRODUCT SET 12 Business Intelligence Applications 12 Business Intelligence Tools 12 Access Enablers 14 Data Warehouse Modeling and Construction 15 Data Management 18 CONCLUSION 19 Brand and product names mentioned in this paper may be the trademarks or registered trademarks of their respective owners. 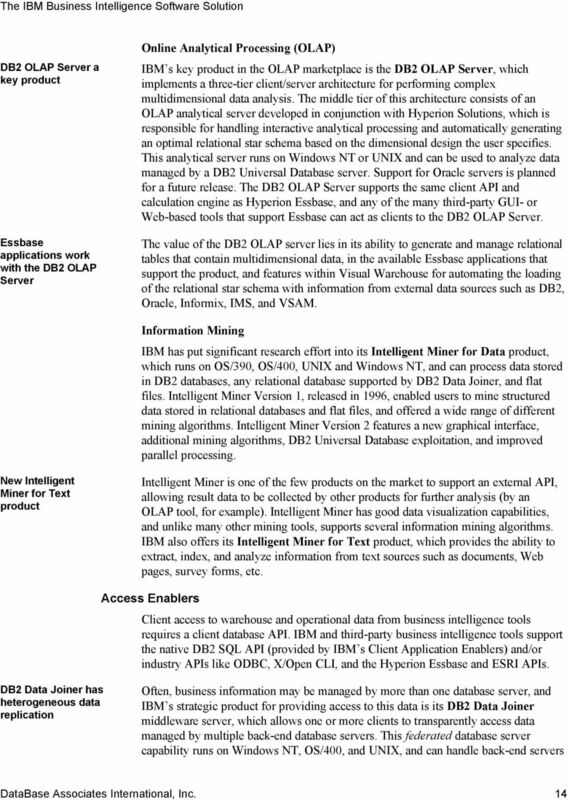 DataBase Associates International, Inc.
ORACLE DATABASE 10G ENTERPRISE EDITION OVERVIEW Oracle Database 10g Enterprise Edition is ideal for enterprises that ENTERPRISE EDITION For enterprises of any size For databases up to 8 Exabytes in size. 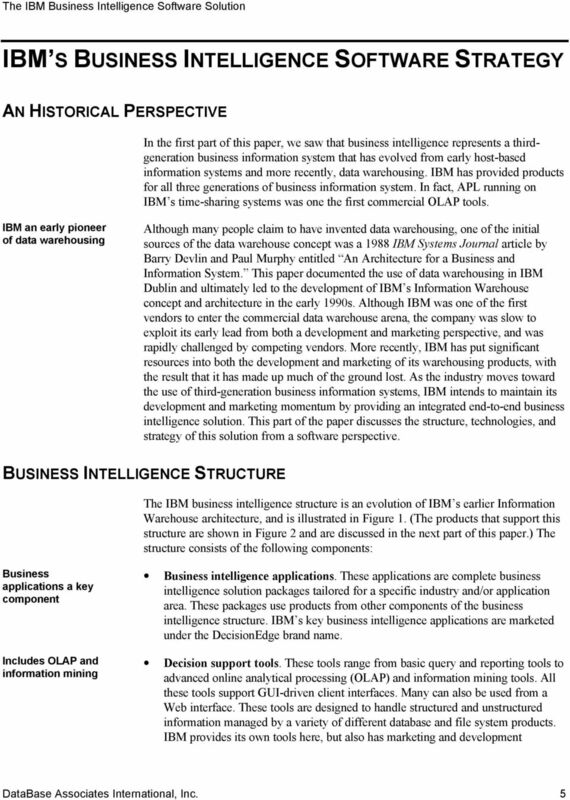 BUSINESS INTELLIGENCE Bogdan Mohor Dumitrita 1 Abstract A Business Intelligence (BI)-driven approach can be very effective in implementing business transformation programs within an enterprise framework. 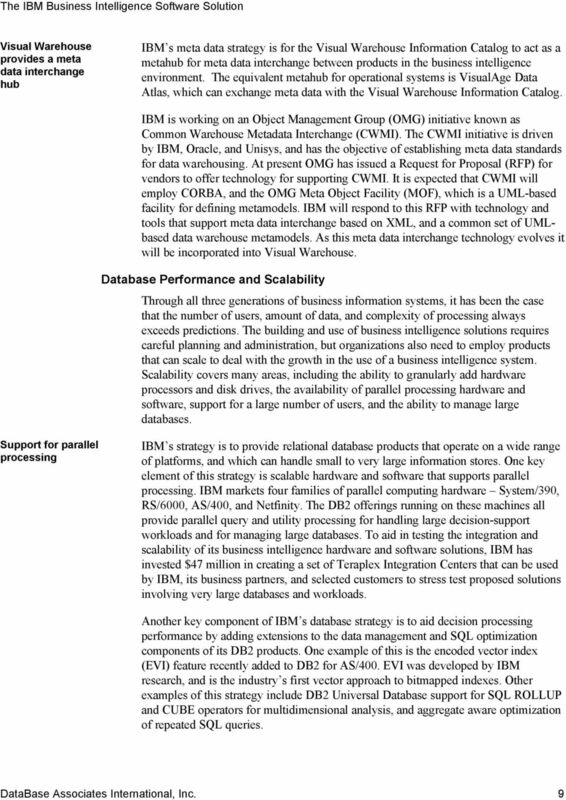 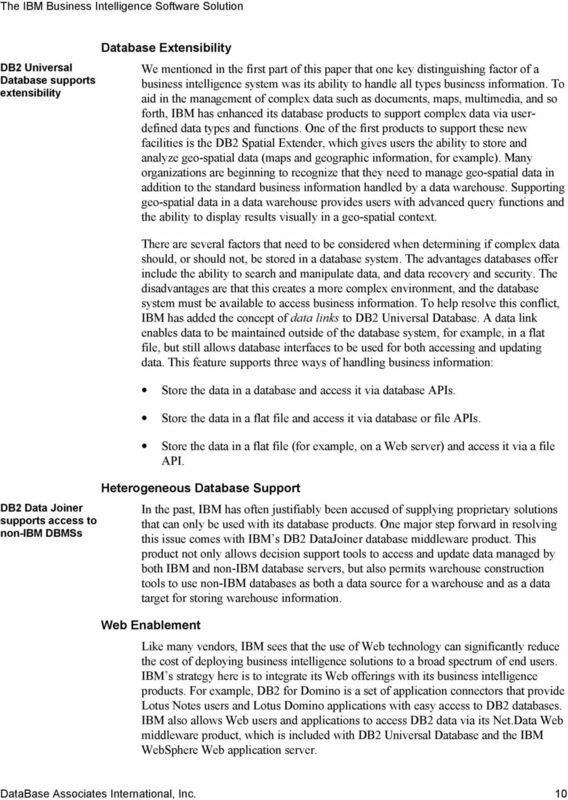 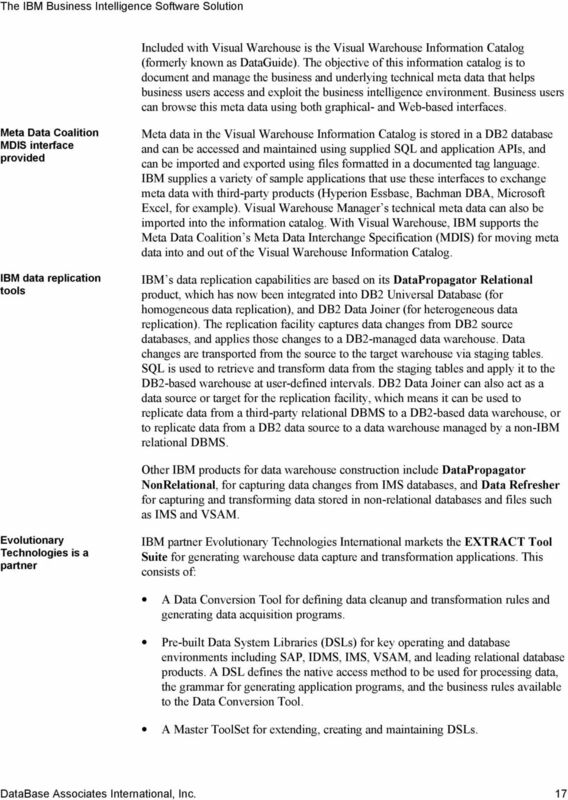 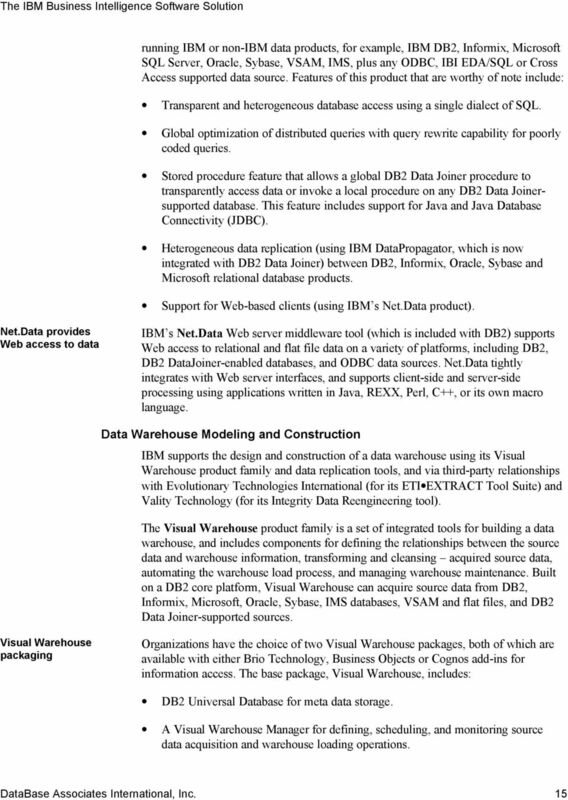 Oracle9i Data Warehouse Review. 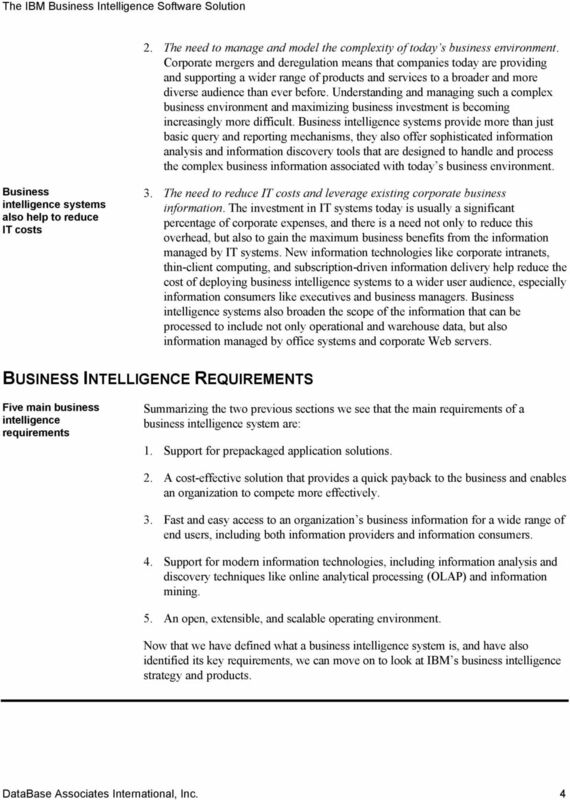 Robert F. Edwards Dulcian, Inc.
Jet Enterprise Frequently Asked Questions Pg. 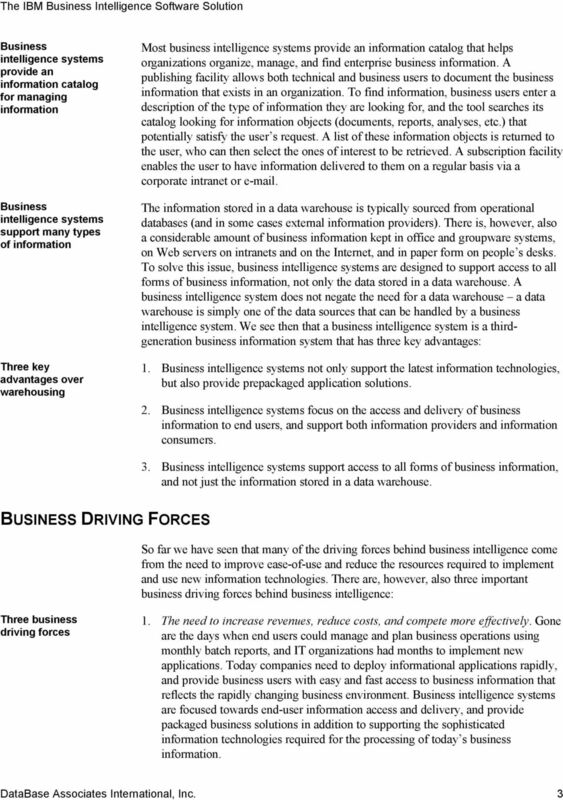 1 03/18/2011 JEFAQ - 02/13/2013 - Copyright 2013 - Jet Reports International, Inc.
A roadmap to enterprise data integration. 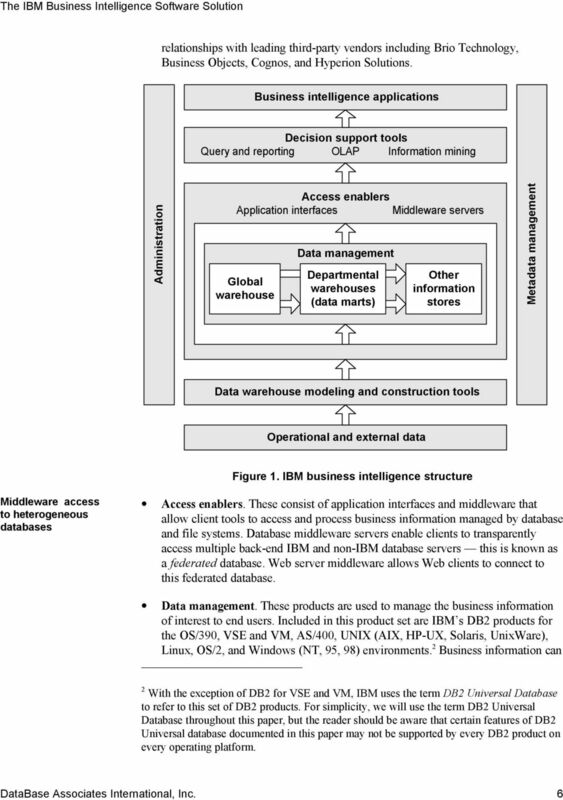 Why Big Data in the Cloud?